In this sub-$100 article we felt our existing six models were still popular and relevant enough to stay in our chart – so we expanded the list to include three additional headphones – the awesome AKG K240 Studio, the LyxPro HAS-30 and the Status Audio CB-1. As recent as a decade ago, being able to do studio monitoring on a budget wasn’t exactly easy. However, in 2018, things are very different. Instead of having to invest your cash into a pair of $500 studio headphones, you can now get the job done for a lot less money. What To Expect From $100 Headphones? 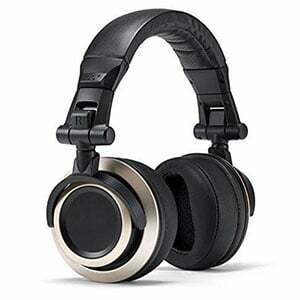 Today we are going to show you some of the very best headphones in the affordable segment. While all of them come in at under $100, some of them are actually among the best studio headphones period. We will go over our picks and then talk about what to expect from models found in this segment of the market. As you are about to see, affordable no longer has to mean bad! A simple yet capable solution that inspires confidence in a studio environment. An alternative to all the monotone designs out there that actually works. Great set of headphones from a massive brand with plenty of experience . Superb sound from this affordable semi-open-back pair. Budget phones that will blow you away! No-frills foldable design with high-end playback quality. Simple design, great performance and solid build quality define this set perfectly. 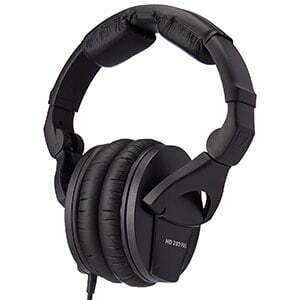 The cheapest pair of headphones in this category, but also very capable . Audio Technica has been known as one of the very few brands who could always deliver great value for your money. Especially in the budget segment where it counts the most. Their ATH-M40x are by far some of the most popular and capable studio headphones you can find today. Audio Technica did everything right, from designing a great chassis to choosing the right type of transducers for the occasion. The end result is a set of headphones that offers optimal performance for the money, all while looking like something that costs at least twice as much than they really do. Audio Technica ATH-M40x has been around for a long time, during which they have proven their worth on numerous occasions. Shure is a well known name in the audio gear business. Their microphones are nothing short of legendary. However, Shure's range of studio headphones is nothing to joke about either. Shure SRH440 is among the rare affordable studio headphones which offer a perfect balance of performance, weight and comfort. If you look closely, you will notice that everything about SRH440 is optimized towards frequent studio use. That means prolonged time behind a workstation mixing tracks without running into serious user fatigue. For an affordable set, SRH440 are made very well. While they lack the quality materials most of the more expensive headphones offer, Shure made sure that the user was given something that could keep up with frequent studio use. CAD Sessions MH510 have stood out for several reasons. The most obvious one is their appearance. In a sea of all-black headphones meant to win you over with their professional look, CAD has decided to do something completely different. They have made Sessions MH510 in a white and red color combo. However, looks are just a part of the story. These headphones actually have the performance to back that all up. With two 50mm drivers, you are looking at plenty of volume and quite a bit of definition. That clinical transparency is there with no significant bias to be found anywhere. In terms of comfort CAD has fixed these up with plenty of padding, ensuring minimal user fatigue over time. Sennheiser's ability to deliver great solutions on a budget is well known by now. Sennheiser HD280 PRO is an example of this ingenuity in the realm of studio headphones. Where other brands usually struggle with making a good compromise of performance and design, Sennheiser seems to always find that golden middle. For what is essentially an affordable set, Sennheiser HD280 PRO delivers a surprisingly transparent performance in a chassis you can easily wear for a prolonged period of time. Since comfort is often times a subjective thing, Sennheiser left us with the ability to easily swap out padding for something that fits better. Add a coiled cable to that mix and you've got a great beginner platform that just works. This popular Austrian-designed pair of semi-open-back cans from AKG are a newer entry in this chart, but quickly pushed their way up the table due to the great value on offer. For well under $100, this pair arrives with a stylish black and gold design, soft over-ear leather cups with their own suspension system, and a detachable 3-meter OFC cable. The advanced XXL transducers with Varimotion diaphragms lead to awesome sound, with powerful basses and crisp highs. Overall, it’s hard to pass up on this pair! You can read more on the AKG K240 Studios in the complete review. While the brand name may not be particularly big, this pair of HAS-30s from LyxPro has blown us away with the value on offer. The design and build are high-quality – nothing too dramatic, but solid in feel and with a very appealing style. With lots of padding in all the right places, these closed-back cans also fold up neatly into the included case, which makes storage and transporting a cinch. The performance is also very notable, with a wide frequency range and a neutral sound, which is perfect for mixing. Of course, the full HAS-30 review has all you need to know! 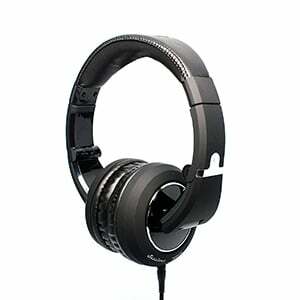 Another new addition to this list is an incredibly popular pair of closed-back headphones from Status Audio – the CB-1. While these studio cans look a little basic, with no branding, they feel sophisticated, lightweight and very portable with a neat foldable design. However, the adjustable padded headband and overstuffed ear cups make for a snug and comfortable experience, no matter how long you wear them for. But it’s the sound that makes this pair of cans so popular. As we highlight in the complete CB-1 review, there is a very flat response for critical listening with an all-round decent sound isolation. KRK is sort of a patron saint of budget producers, and has been so for a while now. Their studio monitors are known far and wide. With that said, KRK's line of studio headphones brings that same reliable monitoring performance into a more compact format. 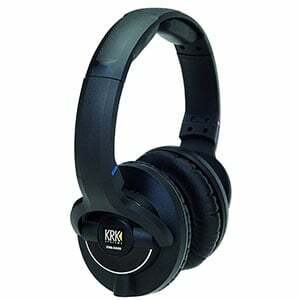 KRK KNS8400 is an affordable set packed with standard and some not so standard features for their price range. Performance wise, there is plenty of transparency and width to the frequency response range. These are the type of headphones that will render your mix the way it really sounds, even if there are really subtle details in there. On top of that, comfort is fairly decent while the build quality really stands out as great. 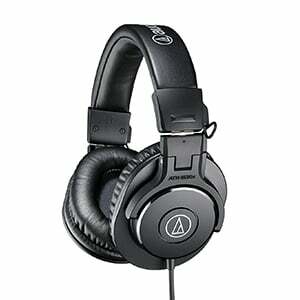 Audio Technica has made a huge impact with their ATH M series of headphones. ATH M30x is one of the lower end models, but also the one that probably offers the best bang for the buck in the affordable segment of the market. What makes them really great is the fact that Audio Technica used more or less the same frame for the entire family. In other words, you get the same design solutions other models offer. In terms of performance, things are great. Bang for the buck, M30x offers just the right kind of transparency, clarity and definition. 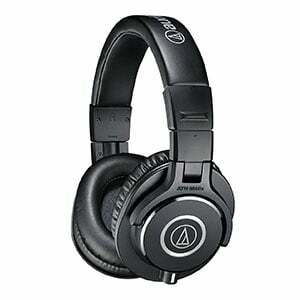 If you're limited by a really tight budget, something like Audio Technica ATH M30x is probably the best way to go. In many ways the $100 segment is the sweet spot of affordable studio headphones. You are getting decent hardware packed into relatively more elaborate frames, all backed up by good performance. Right around this price point you will start to experience that phenomenon where you get less additional performance as you throw more money in the pit. For example, the difference between a set of $100 headphones and a $200 pair of studio headphones is not that big at all. Once you get used to your affordable pair, it will take decent amount of money before you will experience a dramatic difference in performance. With that said, the most important thing to remember is that a $100 set of studio headphones will allow you to get the job done. The type of transparency these offer will get you plenty of insight into what goes in in your mix. In a context of a home studio, or even a half professional one, that’s good enough to say the least. The $100 range is where most manufacturers generally cut on comfort and materials in order to boost that response. Comfort is probably the biggest issue we have to deal with when it comes to affordable headphones of any kind, not just studio ones. To get that perfect fit and finish every time, the company who’s producing the headphones has to invest quite a bit of effort and funds. It mostly comes down to materials, weight of the headphones and how they clamp onto your head. The sad truth is that most of these are not among the primary objectives in the affordable segment. Does that mean you sentenced to everlasting discomfort? Not at all, but there will be little things that will start to stand out over time. For example, ear pads are among the usual suspects. Affordable headphones often times come with the most basic vinyl ear pads, which look pretty good but don’t feel so great after an hour of use. Sweating is an issue, especially if you are working in a room that lacks an AC unit. Good thing is that almost every ear pad design you get out of the factory works. You will get that proper seal and isolation for sure, it’s just about getting used to vinyl. As always, one way to deal with this issue is to swap the ear pads for a better pair. Some will argue that it’s not worth the investment, but once you get into $100 range that is no longer the case. A decent set of ear pads can completely change your monitoring experience. While ear pads might be a problematic component, the rest of the padding is often done right. Most of the brands that produce high-end gear tend to use aspects from their more expensive models in their affordable headphones. In most cases you won’t get exactly the same as a premium model, but the core structure of the padding will be the same. This way, brands are able to cut down on costs while still providing an adequate level of comfort. Additionally, there are numerous models with a wire frame headband that have those little memory foam flaps. Those are a perfect example of a simple solution that is both inexpensive and effective. Transducers installed in some of the headphones we have shown you today are decent to say the least. That much is for certain. Transparency is always the elephant in the room, for a good reason too. Fortunately, most of these headphones bring a rather neutral response that can be corrected with EQ if there are any noticeable dips or spikes. However, more often than not, doing this isn’t necessary. Aside from the range and transparency, drivers from this segment offer a good amount of definition. When it comes down to those subtle details in a mix, having that clarity definitely helps. Overall, it is becoming apparent that hardware is no longer that much of an issue. The eternal race to beat the competition is driving numerous brands to up their game in the affordable segment, which translates to better performance for less money. Perhaps one of the most important differences between headphones you can get for around $100 and cheaper models is the cable. Aside from them being better quality in general, almost all of the models we have listed above will feature a detachable cable. This allows you to rest easy knowing that even if your cable goes bad, your headphones won’t suddenly turn into an ornament. The other consequence of having a detachable cable is the ability to plug in one that is as long as you need it to be. If you check out the specs on most of our picks, you will find that each of them comes with two cables. One is often a flat 10 footer, while the other is a curled 10 feet unit. Granted, these lengths will work more than well with most studios, there are those special cases when you just need more cable. That little bit of versatility absolutely matters. Buying a set of headphones in the $100 price range can be exactly what you need if you want studio-quality cans on a tight budget. It’s easy to get drawn into more expensive gear, but frankly it’s not necessary when you consider some of the features and sounds on offer from the phones on this page. Any of the models we’ve shown you today will help get you started in the studio and allow you to progress in sound mixing and editing. Chances are, it will be quite some time before you end up needing an upgrade!